The Kermadec Islands are located in a climate zone with very few other islands. The latitude of the subtropics co-incides with the desert zones of all continents, areas of high pressure where winds converge, resulting in high evaporation and a deep thermocline accompanied by infertile seas. Living on a very small outcrop, surrounded by an oceanic desert, furthermore poses problems to which the organisms have had to adapt. This chapter examines all these questions, in order to understand the (marine) ecology of these islands, and concludes that the Kermadec marine environment is fragile and that complete protection is our only option. Why NZ is so special: a summary of what makes New Zealand a special place. Oceanography: An explanation of clockwork Earth. Relevant to all sections. For corrections, suggestions and improvements, e-mail me. New Zealand occupies a special place in the World's natural affairs, as can be seen from the map on right. This is a view of the globe centred on the South Pole. Three main continents can be seen extending hesitantly southward: South America, Africa and Australia. But they are separated by insurmountable distances, reason why their flora and fauna differ completely. Also their marine environments have nothing in common, even though marine creatures could swim from one continent to the other. The reason they cannot do so, is that they won't survive the trip, as the blue seas are water deserts, with too little food. Only the largest of marine creatures, having enough spare fat, and the advantage of scale, can make it (whales). Remarkably, on this side of the globe, very few islands can be found, and these too are often separated by insurmountable distances. Of all the islands in New Zealand's (idealised) climate zone (dark blue band), NZ is the largest, and sufficiently separated from Australia to function as a separate continent having its own flora and fauna. NZ thus occupies a very special position on the globe, as far as its environment is concerned, and this is borne out by its many endemic species, which are found nowhere else. 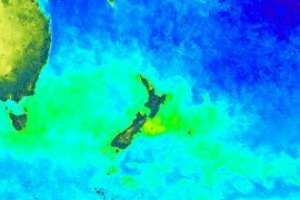 New Zealand is rather isolated, as it nears the centre of the "water world", and the Kermadec Islands lying further NE, even more so. Temperature matters much to creatures that are unable to regulate their body temperatures. Metabolic activity of enzymes changes remarkably with a change of 6 degrees in temperature, which is the main reason that climate bands are found from the equator to the pole. Although land temperatures vary wildly from day to night and summer to winter, the sea's temperature is far more stable. Yet in NZ, considered of temperate climate, a seasonal swing of 6-8ºC can be observed. For the Kermadecs this is a little less (6ºC). 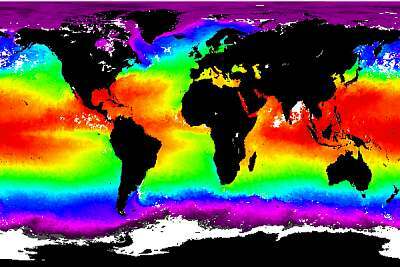 The colourful world map on right shows average seawater temperatures. Notice that the red band (tropics) is very wide compared to the blue bands (temperate to cool-temperate). The Kermadec Islands are located in the green band of the subtropics. Notice how this band comes down on the E side of southern continents, and up on their W side, due to ocean circulation. For northern continents, this is the opposite. Notice how the Galapagos Islands, located W of South America, near the equator, is also inside the green band. Notice also that there are very few islands in this band. The drawing on right sums up the world circulation in the atmosphere (See oceanography/circulation). It shows that the circulation patterns change drastically around 30º latitude. In the tropics, the trade winds blow towards the equator, saturating with moisture. They then rise and release their moisture, circulating back to the subtropic high and descending as dry air, creating desert zones. The Kermadecs are located in this area, experiencing trade winds in some seasons, and westerly gyres (as in NZ) in others. This diagram sketches the basic currents around New Zealand (See oceanography/New Zealand). As mentioned before, the South Pacific ocean circulation (gyre) pushes warm water down Australia's eastern shore, where some splits off along the tropical front (TF), as it meets cooler water travelling north. Importantly, it shows that the general direction of all currents is eastward. On the map, three subtropical island groups can be seen, from W to E: Lord Howe Island, Norfolk Island and the Kermadec Islands. The direction of the current suggests that eggs and larvae of marine species travel mainly eastward, and that the reverse is unlikely. It can explain why Australia has practically no NZ species, but NZ has some Australian species. Note also how the sub-antarctic islands are isolated from NZ by the Sub Tropical Front (STF). This diagram shows the layering in the ocean and its deep circulation, which is not important here. Due to high surface temperatures in the tropics, the surface water is lighter than the deep water, resulting in a thermocline at 100-200m depth. This thermocline prevents nutrients from resurfacing, resulting in infertility of the sea at its surface. In the subtropics, evaporation is high, resulting in slightly saltier surface waters (see map in oceanography). The Kermadecs are located here. 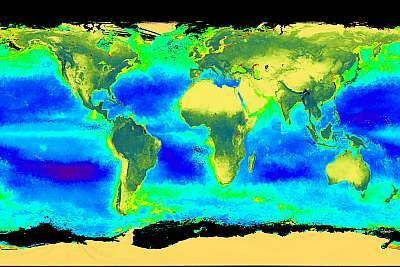 The net effect is that like the deserts on land (yellow), similar deserts are found in the oceans (deep blue) at roughly the same latitudes, as shown by this satellite image of actual chlorophyll concentrations, representing the amount of plant life, on which all other life depends. Tucked away in the righthand margin is NZ, blessed by rather high fertility in its seas. But the Kermadecs lie just outside, as the detail map below shows. This map is an enlargement of the one above, with left and right margins joined. It shows how New Zealand's seas are relatively productive, with a peak off Kaikoura, east off the South Island. The Kermadecs jut out into the blue desert, but some peculiar mixing is noticeable. Experimenting around the ocean ridges of the Hawaiian chain of islands, scientists have discovered  that the tide wave, which raises and lowers the water along continents twice daily in the rhythm of the moon, causes deep currents when hitting the Hawaiian ridge head-on. These currents disturb the deep thermocline, bringing nutrients to the surface. A similar situation is likely present at the Kermadecs, and indeed, satellite images  have shown a noticeable distortion in the tide wave,which causes local ocean currents and swirls. When diving the Kermadecs, these strong currents are very noticeable. The conclusion is that, although the Kermadecs are located in a blue water desert, a slow supply of nutrients makes it to the surface, supporting not too abundant life. Hawaii Ocean Mixing Experiment (HOME). Rob Pinkel, Scripps Institution of Oceanography. A continental shelf, the stage for abundant life. The sea soil here returns nutrients from dead organisms and wastes to the water. Shelter from winds, which makes the sea winds stronger than the land winds, resulting in sea surface currents returning nutrients to the shore. Ocean currents, following the continental slope, rotate in such a way that they bring deep nutrients back onto the continental shelf. Current eddies branching from the ocean currents, bring nutrients back. For a small land mass like Raoul Island, these factors are almost negligible, reason why nutrients originating from the island, are quickly lost. Small islands like this surrounded by a blue ocean desert, are thus destined to look more like a desert than a fertile ground under water, which makes life there difficult, but sea birds may play an important role. The diagram shows how sea birds can play an important role in recycling island nutrients. It is an advantage enjoyed by outlying islands, because rats, cats and stoats have driven sea birds off the mainland, allowing them to congregate on safe, offshore islands. Due to ocean mixing near islands, which is still poorly understood, there is a slow upward trickle of nutrients from the deep. Add to this those from island erosion and volcanism and bird droppings. Rains wash the nutrients down, causing phytoplankton to bloom in pockets around the island and further down-stream (left). Living from this phytoplankton, shrimps multiply their numbers, and these are eaten by fish. Both fish and shrimps are caught by sea birds, who spend some time on the island, emptying their guts overnight. In the cycle, the sea soil, and planktonic bacteria in the water help to recycle nutrients from dead animals and wastes. But overall, some (or most?) nutrients are lost to deeper water. How large the influence of birds is on this nutrient cycle, is unknown. It would be interesting to monitor the fish life around Raoul, as its bird numbers increase. It could well be possible that this has a large and beneficial effect on the sea life there, but there is yet another factor. .
Why is it that the Kermadecs have no kelp plants? Why is it that our luxuriant kelps, growing the full length and width of NZ, do not grow here, only 800km further north? Surely evolution would have been able to adapt them or some relative for living here? The difference in temperature is only 3-4ºC. And why is it that so many of our NZ fish species can't live here either? We'll try to answer this question, because it lies at the very heart of understanding the islands' marine ecology, but first a disturbing observation. We noticed symptoms of (serious) environmental stress. How is this possible in a pristine environment so far removed from human influence? Would global pollution be to blame? The volcano perhaps? Few juvenile organisms and missing year classes. The juveniles of almost every marine organism are usually the most sensitive to pollution and other stresses. Spawning is a delicate event that can go wrong in any of its many stages. When successful all along this chain, it results in recruitment (juveniles settling from their planktonic stage). Year classes are sometimes hard to assess, but one can almost always distinguish five age groups: this year's babies, last year's juveniles, young adults, mature adults and old adults. What we observed was that there was ample evidence of (serious) recruitment failure in all organisms observed. Large sessile organisms removed but not replaced: Open space on the rocks is very precious real estate. 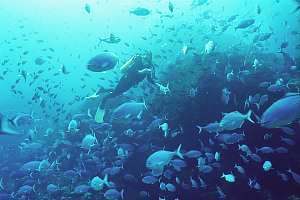 In a healthy environment, it is almost instantaneously occupied, often immediately with opportunistic invasive species like barnacles, seasquirts, bryozoa. 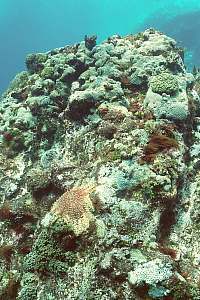 Because such opportunistic species don't live long, but reproduce fast, the rock space eventually becomes available again, during which time more permanent species have found it. We found an unusually large part of the rocks unoccupied. Ironically, the Kermadecs have hardly any invasive species. Even the barnacles there live with restraint! 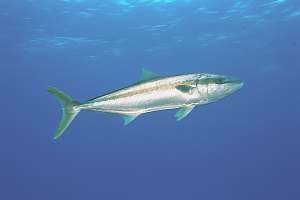 No schools of small pelagic fish: We found no schools of pelagic silver fish like pilchard, koheru, jack mackerel, trevally, and their fast and voracious predators. But here and there a kingfish was seen, although looking thin and emaciated. Also a small pod of dolphins keeps a presence here and a small school of northern kahawai. Poorly grazed algae: Although there are grazers like drummers, turtles, sea urchins, top shells and others, many rocks remained poorly grazed. Such an observation may point to poor replacement, or a recent mass die-off, but it may also be a normal situation after good growth in summer (we were there in autumn). We suspected slow replacement of grazers who died recently. Altogether, it is a bit of an enigma for which we have the following explanation: Nearly all marine organisms spend some time of their lives as eggs and larvae, in the surface layers of the sea. In this time they need to grow from a tiny 1mm to something 100 to 10,000 times larger, which is a major feat. The problem that the recruits of the Kermadecs have, is that they have practically zero chance of settling on a shore, because the land is so small, the sea around so large, so infertile and with currents taking them away from their parents. Only once in many years, will some recruits make it. Those species with parental care, like triplefins, demoiselles and crustaceans, will do much better, because their larvae spend a shorter time among the plankton, which gives them a higher chance to recruit close to home. The male three-lined cardinalfish (Apogon doederleini) even broods the eggs in his mouth until the juveniles outgrow the available space! The giant limpet ensures successful spawning by carrying its much smaller male on its back! It also helps survivors to grow old, because that too, increases the chance of spawning successfully. can maintain themselves at the Kermadecs! Kelps may simply be unable to survive in warmer waters, much like corals do in colder waters. The coral cover is almost absent only 100km south of Raoul! Drift kelps have been found at the Kermadecs (carpophyllum species), so one would expect fertile material to turn up there occasionally. Kelps may not live long enough to reproduce in the conditions of a small island surrounded by a large, infertile ocean, even though most recruit over small distances. Kelps have a dual-phase life cycle, a bit like mosses and ferns do. For each phase, a planktonic dispersal follows, which reduces the chance of recruitment further. Although kelps conquer space above the rocks quickly, corals win space on the rocks slowly but securely, and in such a way that kelps cannot settle where corals are. Over time corals thus outdo the kelps for space. Nutrient concentrations may not be dense enough for large (brown) kelps. Corals on the other hand, living in symbiosis with algal cells (zooxanthella) inside their bodies, have an unequalled metabolic efficiency, and can live in infertile waters. Kelps may be grazed by grazers like urchins and drummers, faster than they can grow. This has been observed in NZ too, on isolated rocky outcrops. Once the kelp has been removed by a disaster, it fails to grow back, because the young plants are grazed faster than they can grow. 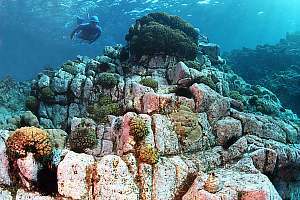 For kelps to survive, they need a large rocky area. Kelps may not survive tropical cyclones well. We have observed that large storms create barren zones (storm barrens), the width of which is related to the depth of the sea bottom. In Niue the barren zone extends over the entire shore to depths over 70m. Like Niue, the Kermadecs do not have a continental shelf that abates deep storm waves. It may well be that tropical cyclones on islands wihtout a continental shelf, make life impossible for kelps. The small size of the islands poses another problem, that of insufficient habitat space. Although the marine reserve proper measures 7480km2, this is overwhelmingly empty seawater. Raoul with its 31km2 land area, has probably no more than 20km of rocky shore, including all the islets around it. Most of this consists of boulders bordered by a shallow sandy bottom, razed by ferocious waves. For the giant limpet, which grows with densities of 2-6/m2, perhaps only 10km of suitable habitat is available. Its zone is only two metre or so wide, so a quick estimate of their numbers is ~30,000. This is a small number for a viable population, particularly for a grazer, on which other species should feed. It must not be surprising then, that they do not appear to have natural enemies, and that they grow very old. To increase their survival chance, the large females carry small males on their backs! Take the giant groupers. They are top predators, living in the slow lane, but also growing very old. Nobody has surveyed their numbers, but my own estimate is 20/km, or a total of 200, plus an equal number of small ones. The large males are certainly sporadic. They are all born female, and change into a male at 1m length (40 years old). This makes them rather vulnerable to exploitation. There are only few of each species. They can't migrate and mix with other gene pools. All these factors add up to the conclusion that the Kermadecs constitute a fragile environment. Had it been larger, it could have supported more unique (endemic) species. Even so, it will take decades before all endemic species have been found and identified. Scientists have sampled the coral species at the Kermadecs, and found that at Raoul in shallow water of 1-6m depth, the coral cover can reach 20-40%. South of Raoul, the coral cover reduces dramatically to less than 1%. There are 17 hermatypic (zooxanthellate) species and 7 ahermatypic at Raoul, but only 2 hermatypic and 2 ahermatypic at l'Esperance. It shows that even corals are not very successful at this latitude and loneliness. Of the close to 400 species of mollusc found, some 20% is thought to be endemic, and all other species are probably stragglers (allopatric), not normally breeding here. The one really successful marine creature is a coralline alga (Lithtohamnion sp. =stone-leaf), or popularly called pink paint. It is found as a major cover on all rocks and all depths we could dive to. Look for it in the many photographs in our photo galleries. Over 120 photos of habitats, corals and marine creatures are displayed in the photo galleries attached to this Kermadecs section. Here we have chosen a few ecologically important ones. 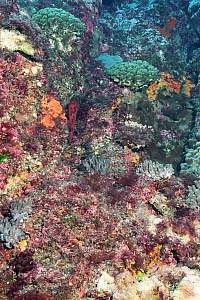 f031028: Abundant coral life is observed in shallow waters, made up of few coral species. They do not grow fast enough to create coral reefs. Notice the rivers of poorly grazed red algae and the recently vacated homing spots of sea urchins (dark spots), who created these patches and rivers of red algae. In the backgrund a small school of northern kahawai. f031408: Giant limpets (Scutellastra kermadecensis) are crowding for space, but some of their homing spots have been vacated. A large number of year classes is absent. Notice how these animals are restricted to a very small homing range (hand-sized) and also a narrow habitat zone(around low tide level). They appear able to graze the limestony pink paint, from which they may derive calcium for their thick shells. f031419: A formation of hard basalt rock at a depth suitable for both hard and soft corals. 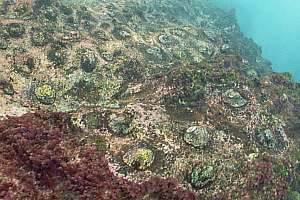 The area is dominated by pink paint and fierce grazers like the brown urchin (bottom left) and top shells (bottom right). This area is grazed to the maximum, perhaps preventing corals from settling. f031506: Under overhangs and on the roofs of caves, one can study the fragile and varied communities of the deep reef, which is beyond diving range in these clear waters. 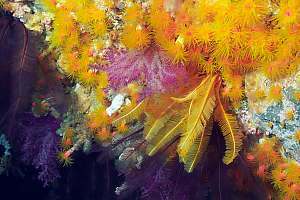 In the centre a yellow and a brown featherstar, a purple gorgonian, surrounded by yellow tube corals. f031312: A dense school of blue maomao has arrived out of sheer curiosity. They catch zooplankton in the currents around promontories, but a diver is a rare sight for them. Dense schools of fish are found, but they are not common. Amongst the blue maomao, one can find a related species, the blue knifefish. Blue maomao are excellent survivors, able to switch to a plant diet in case of zooplankton shortages. f031704: The gentle giant groupers gave the motivation for creating a marine reserve here, because even a few fishermen could have wiped them out, as has happened elsewhere. They are inquisitive and intelligent creatures, often underestimated by us. Here a snorkeldiver hands out some food to gain trust, but these fish thrive on more personal interaction. 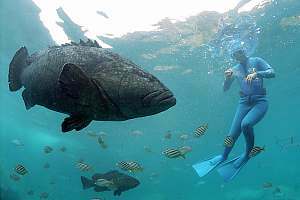 Born female, the grouper changes into a male at the whopping size of 1m! Consequently there are very few mature males. f031325: A rocky pinnacle is covered in corals, down to where the large crown of thorns star can reach, because higher up, it is knocked back by wave action. This star is not particularly a voracious predator, and their numbers are low, but because the corals recover very slowly, it has nonetheless a major influence on this habitat. Below the star some fleshy corals in which it is not interested, possibly because its stomach has adapted to particular types of coral. As it turns out, these are also the fastest growing ones. In all, this star may have a beneficial influence on the diversity of the coral habitat. Recruitment of young organisms into the vacant areas is poor. f031334: The shaded side of the pinnacle shown left, shows the rock cover in a gradient from light (top) to dark (bottom). Corals able to grow in poor light, have zooxanthella with dark, almost grey pigment (top right). Some of these look like grey encrusting sponges (middle right), competing with true orange encrusting sponges. 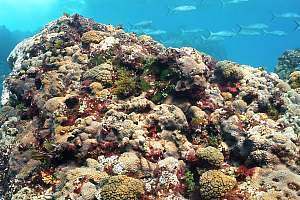 Then comes a band of fleshy corals, who live deeper but still need sunlight, and finally the rock is left bare, covered in pink paint and short algae. This image, like the one on left, shows a lot of vacant space, which has been left unoccupied for a very long time. Although technically, the Kermadecs are located in a desert region, they are also part of a weather system influenced by warm currents, cooling as they travel southward, causing rain in the process. On the opposite side of the Pacific, along the coast of Chile, the opposite happens. Here cold currents warm up, causing droughts. In all, these islands enjoy a healthy amount of rainfall, comparable to that of Auckland: 1500mm in the wet season from October to January. the dry season runs in the opposite months April to July. Its temperature ranges from 16.0 in August to 22.4ºC in February. The Galapagos Islands, located near the equator, have a similar marine environment and water temperature, but the islands are dry and desert-like. Raoul is densely covered in a climax forest of Pohutukawa (Metrosideros kermadecensis), Karaka and Nikau palm (Nikau Rhopalostylis baueriana), from the cliff face to the top of Mount Moumoukai at 516m. The mountains catch more moisture and here one finds a rich variety of mosses (52), ferns, lichens and fungi (89). The forest community here includes Ascarina lucida, Melycitus ramiflorus and Pteris comans. The native forest hosts 113 native (NZ) vascular plants of which 23 are endemic! The understorey of the forest consists mainly of Myrsine kermadecensis; Lobelia anceps, Poa polyphylla, Coprosma acutifolia, Coriaria arborea. The coastal vegetation consists mainly of: Myosporum obscurum, Coprosma petiolata, Asplenium obtusatum, Cyperus ustulatus, Disphyma australe, Scirpus nodosus. 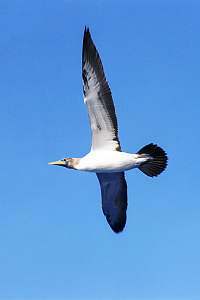 Many sea birds have evolved to migrate vast distances, and the Kermadec's isolation is no real obstacle to their distribution. But when they gather in their millions, they also need to be fed, which requires a rich source of food nearby. Historic accounts talk of millions of breeding seabirds in some seasons, but they have been discouraged by the introduced predators. Still present are 14 species, including 10 that breed nowhere else in NZ, like the Kermadec petrel (Pterodroma neglecta/ cervicalis) and the black-winged petrel (Pterodroma nigripennis). There are 3 endemic breeders. The masked gannet or blue-faced booby (Sula dactylatra) is a large bird that does not build a nest but lays its two eggs in a hollow in the ground, from August-November. A number of these birds are resident here, and they are the first ones to meet when approaching the Kermadecs. The photo on right is that of a masked gannet. The red tailed tropic bird (Phaethon rubricauda) (Maori: amokura) arrives in October and lays eggs in December - January. They lay a single egg in the holes in the cliff. The parent bird is beautifully pink with a red beak and one long red feather in its tail. some of these are resident. Godwits and curlews are noticed in Spring and Autumn, probably on their journey from Siberia to NZ and back. The wide awake terns or sooty terns (Sterna fuscata) arrive in August and leave in December. They are very noisy at night, keeping one 'wideawake', and used to settle on beaches like Denham Bay, laying and brooding a single egg. White capped noddy or lesser noddy (Anous minutus) arrive in great numbers during spring. They make nests of seaweed and leaves in the branches of trees, low to the ground. This tern has a black body and silver-grey patch on the top of the head. Kingfishers (Halcyon sancta) burrow holes in cliffs for nests, the young ones appearing in October. Grey duck (black duck) (Anas superciliosa): a small number is found in the crater lakes. Tui (Prosthemadera novaeseelandiae), the same species as in NZ. They nest in the fronds of Nikau palms, building nests of grass, sticks and mud. The young appear in November. Red crowned parakeet (Cyanoramphus novaezelandiae?) (Maori: kakariki): very numerous on all islands. They breed in holes in the cliffs or in hollows of trees. Introduced: Starlings, blackbirds and thrushes and two other species. Raoul has native bees which are black and very ferocious. They find rich supplies of nectar from the pohutukawa trees, which have a much longer flowering season than the NZ variety. Their honey is of the finest grade, some large hives yielding over 30 litres! The Kermadecs lie along the migration paths of humpback whales and sperm whales, seen in numbers in the months of October and November.